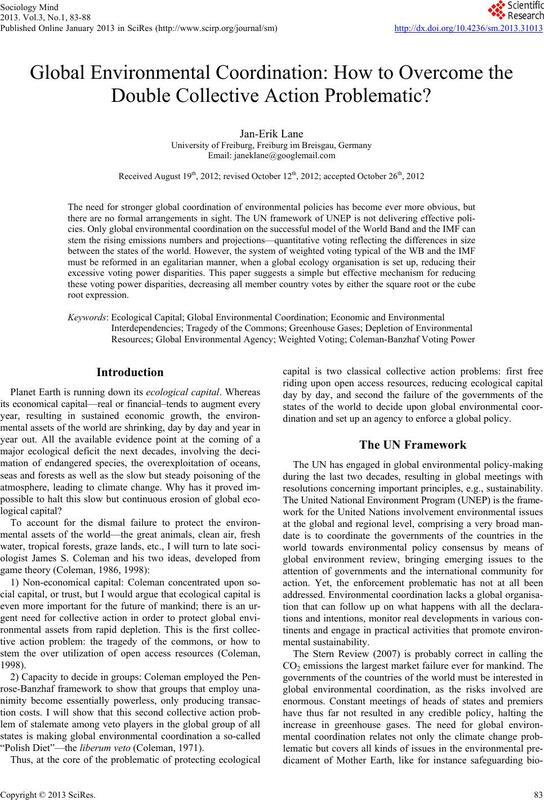 Global Environmental Coordination: How to Overcome the Double Collective Action Problematic? “Polish Diet”—the liberum veto (Coleman, 1971). dination and set up an agency to enforce a global policy. resolutions concerning important principles, e.g., sustainability. 2002; Tol, 2002a, 2002b; Nordhaus, 2007; Weitzman, 2007). commendations when it comes to protecting ecological capital. atmosphere and leading to global warming. meetings of the governments of the world change this trend? Bank (2011) World Development Indicators; data available from http://databank.worldbank.org/ddp/home.do. Earth by increasing ecologi cal capital. ism: rural, feudal and state. tive regimes and qualitative regimes in economic coordination. the second is used by the World Trade Organisation (WTO). distribution of voting rights is feasible and desirable. trade among the roughly 160 member countries in the WTO. vances in the global tr ade regime. In the World Bank and the IMF, the opposite problem exists. Japan: see Table 1: “actual distribution”. of introducing some form of quantitative voting. 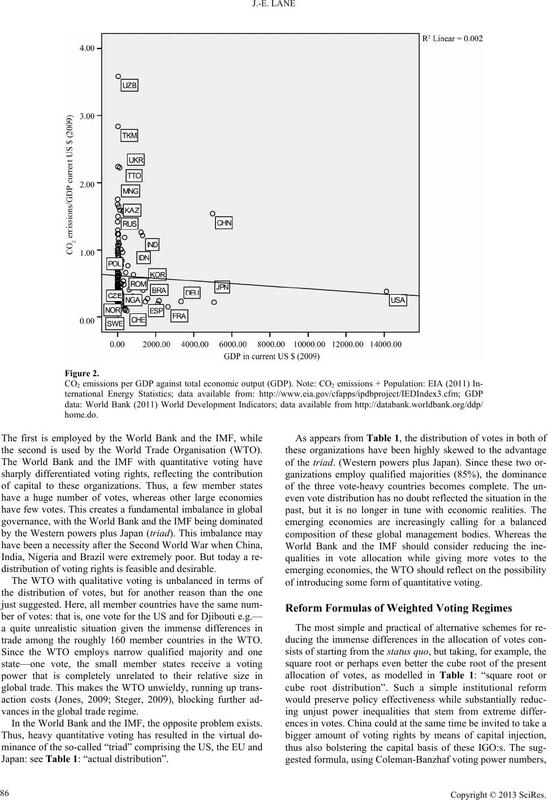 Allocation of votes and Coleman- Banzhaf voting power in the WB and the IMF 1 989-2010.
external/np/sec/memdir/members.html. Recently very minor cha nges i n the s hare of vote s have been done (Bryant, 2008; Leech & Leech, 2012). can be formulated in even more egalitarian formulas. I suggest the creation of a new global environmental agency. bal environmental operations, like saving endangered species etc. effectively today, namely the World Bank and the IMF. Why? tion costs by employing the institution of weighted voting. 1997; Sala et al., 2000; Chapin, 2002). cutting down of rain forests and spreading of deserts. Balmford, A. (2002). Economic reasons for conserving wild nature. adequate “Something”. Wa s h ington DC: Brookings Insti t u t ion. Chapin, F. S., Erika, S. Z., Valerie, T. E., Rosamond, L. N., Peter, M.
V., Heather, L. R., David, U. H., Sandra, L., Osvaldo, E. S., Sarah, E.
lectivity to act. In Lieberman (Ed. ), Social choice (pp. 277-287). New York: Gorden and Breach. Reprinted in Coleman, J. S. (1986). 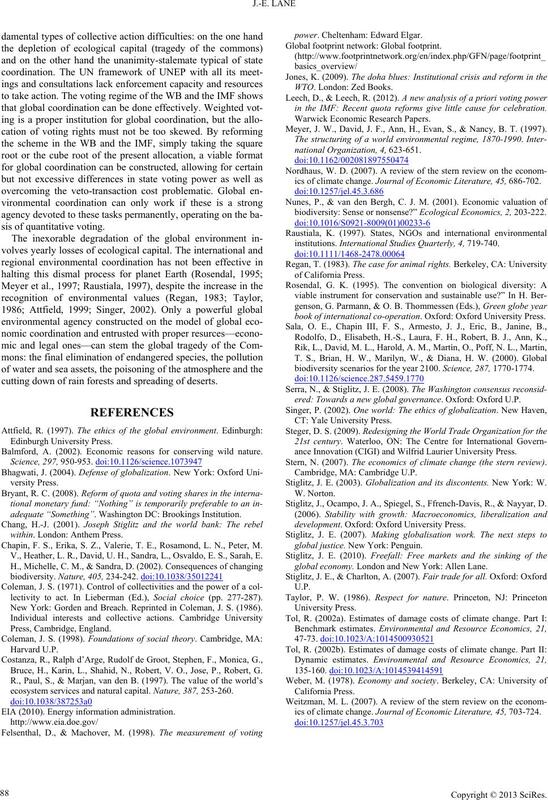 Bruce, H., Karin, L., Shahid, N., Robert, V. O., Jose, P., Robert, G.
ecosystem services and natural capital. Nature, 387, 253-260. EIA (2010). Energy information administration. Global footprint network: Global f ootprint. in the IMF: Recent quota reforms give little cause for celebration. Meyer, J. W., David, J. F., Ann, H., Evan, S., & Nancy, B. T. (1997). ics of climate change. 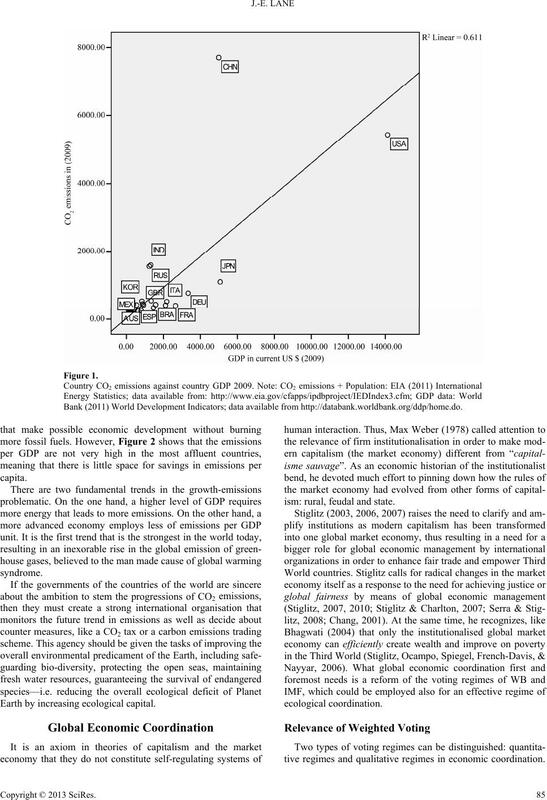 Journal of Economic Literature, 45, 686-702.
biodiversity: Sense or n o n se n s e?” Ecological Economics, 2, 203-222.
institutions. International Studies Quarterly, 4 , 719-740.
book of international co-ope ra ti on . Oxford: Oxford University Press. 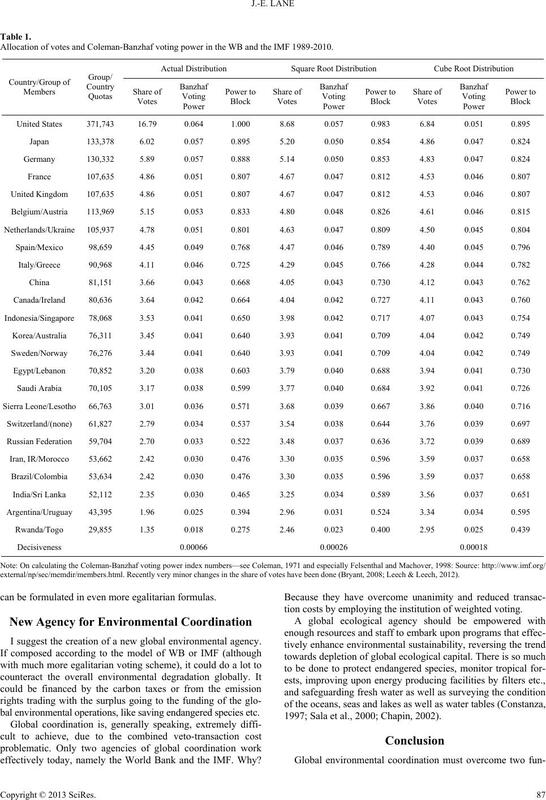 biodiversity scenarios for the year 2100. Science, 287, 1770-1774.
ered: Towards a new global governance. Oxford: Oxford U.P. ance Innovation (CIGI) and Wilfrid Laur ier University Press. Stern, N. (2007). 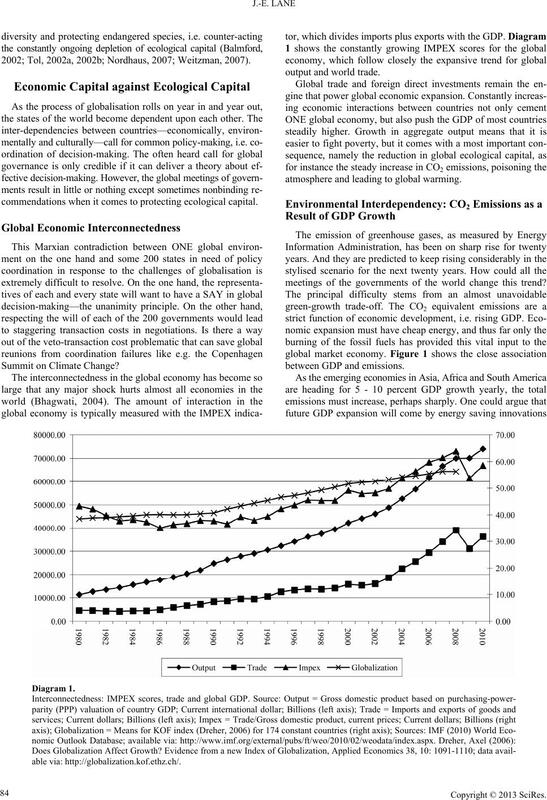 The economics of climate change (the stern review). Stiglitz, J. E. (2003). Globalization and its discontents. New York: W.
Stiglitz, J., Ocampo, J. A., Spiegel, S ., Ffrench-Davis, R., & Nayyar, D.
development. Oxford: Oxford University Press. global justice. New York: Penguin. global economy. London and Ne w York: Allen Lane. ics of climate change. Journal of Economic Literature, 45, 703-724.